Halloween is quickly approaching. If you’re looking for some awesome Halloween board books your toddler will want to hear again and again, check out these. Five Little Pumpkins is written and illustrated by Dan Yaccarino. This book is fast-paced and lively with rhyming text that toddlers will love as they count the pumpkins. Seven Orange Pumpkins is written and illustrated by Stephen Savage. Bright colors and rhyming text will delight little ones as pumpkins disappear in this not-too-spooky Halloween book. Pumpkin Party is written by Maude Powell-Tuck and illustrated by Gill Guile. In another fun rhyming book, animals dress up for Halloween and take part in party activities for an enjoyable Halloween gathering. Peep and Egg: I’m Not Trick-or-Treating is written by Laura Gehl and illustrated by Joyce Wan. Peep and Egg are back again for a Halloween treat. Peep tries everything to get Egg to go trick-or-treating, including telling funny Halloween jokes, but Egg is still too scared. Find out if Egg takes a crack at trick-or-treating or if Egg is left in the dark. Duck & Goose: Honk! Quack! Boo! is written and illustrated by Tad Hills. (Hardcover) The charming duo of Duck and Goose are going trick-or-treating, but will their fear of meeting up with a Swamp Monster ruin their day, or will they figure out a way of facing the unknown and have a fun Halloween? Any of these books would make a perfect treat for your spirited Halloween creatures. 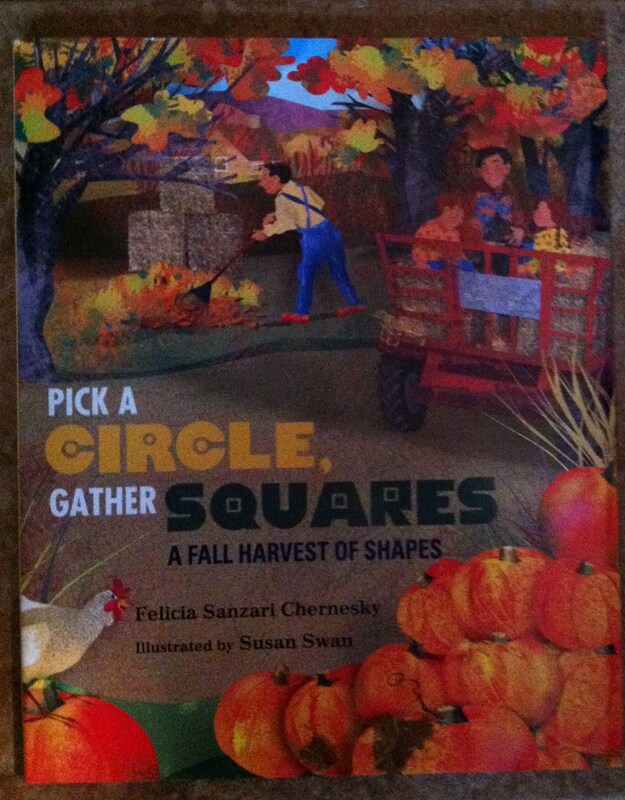 Pick A Circle, Gather Squares: A Fall Harvest of Shapes written by Felicia Sanzari Chernesky and illustrated by Susan Swan is a wonderful seasonal book to introduce shapes. It’s October, and what’s more fun than a family trip to a farm for a harvest hayride and pumpkin picking? While there, the family is on the spy to see how many different shapes they can find. Round pumpkins and apples, a square bale of hay, oval eggs, a rectangular box, hexagons in the chicken-wire fence, and triangle slices of pie. What other shapes can be found? This concept book is perfect to share with preschoolers. Susan Swan’s illustrations include cut paper and bright autumn colors that will keep youngsters entertained as they search for the various shapes.